ADSS.net carries a wide selection of saddle staplers and saddle stitchers. 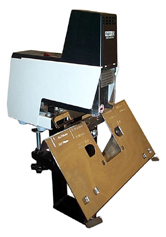 Stitchers are a type of binding machine used to staple booklets, catalogs, brochures and more. They are especially popular for large production scale projects as they are capable of binding large amounts of paper together quickly. saddle staplers staple large amounts of paper along the crease or fold lines with either thread or wire. Stitchers come in a variety of styles and accommodate a variety of uses: production saddle stitchers, manual saddle staplers, and table top wire stitchers. All three of these designs offer flat or saddle stapling options. 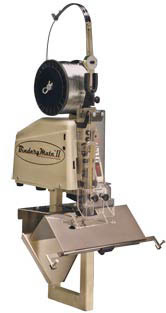 The Bindery Mate II features continuous coil wire stitching, in either flat or saddle style. 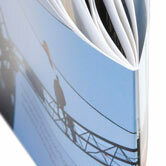 It is an economical choice for commercial-duty projects, stitching up to 50 sheets of 20lb. paper, and depending on the thickness of the book being stitched, can stitch up to 199 stitches per minute. Other features include an optional adjustable floor stand, foot switch operation and an optional gang kit to link multiple stitchers. It uses standard #25 (.020 diameter) wire. The MS-115 is a heavy duty manual saddle stapler that changes from saddle to flat quickly and easily. It features adjustable paper guides (2) for accurate positioning of booklets, powerful lever action and a large clamp to attach to the edge of a counter or table. It offers the power and convenience to fulfill all your stapling needs. The ES-106 Flat and Saddle Stapler is a gangable stapler for flat or saddle stapling. A gangable stapler gives users an incredible amount of flexibility and variation in stapling applications. With a simple addition of extra units and fiber optic cables, users can greatly increase their stapling capacity. The ES-106 is a compact, portable, lightweight, and automatically operated electric stapler. It can staple 2 to 45 sheets of 20 lb. paper, using 1/4" and 5/16" staples. Be sure to order the optional gang kit to benefit from these 'gangable' features; they will greatly increase your productivity by allowing simultaneous stapling. with the power and convenience to fulfill all your stapling needs. for making booklets, catalogs, and more. 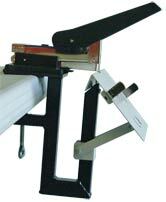 offers both flat or saddle stitching from a continuous wire spool.